It's the Year of the Snake. It's the latest in a public art project now in its eighth year. It's based on the Chinese zodiac calendar; the new year began Feb. 10. The snakes started hitting the streets this spring. When thinking about snakes, I thought of the beautiful repetition of the skeletal structure of a snake. 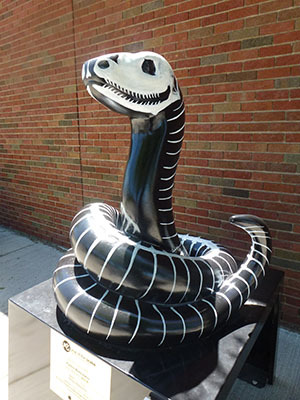 I imagined creating a snake skeletal pattern on a black snake using white paint. The paint used will also be glow-in-the-dark to create a floating like snake when charged or when using UV light. As an educator, I am also excited that the structure would be an accurate representation of the snake skeleton.